Niki app offer, Free pizza hut voucher, Niki Pizza Hut offer, Free Pizza Hut Coupon – Hello guys, Again Niki offer is here & this time we are with Niki Pizza Hut Voucher. we all are aware with Niki is an all-in-one app, it is an AI based personal assistant application. With the help of Niki App you can pay postpaid bill, electricity bill, bus tickets booking and movie tickets online in single plate form with awesome niki cashback offer. Niki Pizza Hut Offer. In this post we are merging 2 cashback offers so that you can get more cashback on your pizza hut booking.Here i am sharing this method to buy pizza hut voucher worth Rs.300 at Only Rs.100 from Niki App. 2. Now Login/Sign Up for a new account. 3. Just go to dashboard of the Niki app and move towards chat section. 4. Here type “Local Deals” and search for “Pizza Hut Rs.300 Voucher at Rs.255” Offer. 5. After Selecting the pizza hut offer, on the upper left corner goto promo-code section. 7. 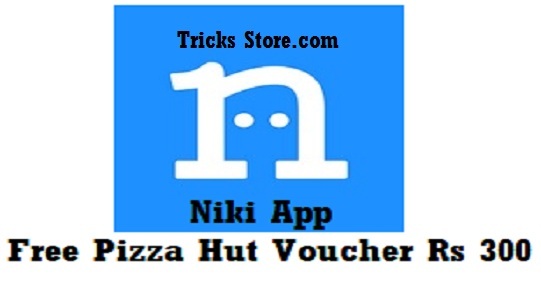 With this Niki Code you will get Rs.100 Discount. 8. After that pay the Remaining Amount using your “Amazon Pay Balance” and you will get another 50% Cashback upto Rs 50 on this deal. So, Here it is you will get Total 105 rupee Off on your billing ammount. Share this with others too and keep reading tricks store for more offers related to free recharge and cashback.